Bu araştırmanın amacı, lise öğrencilerinin görüşlerine dayalı olarak lise son sınıf öğrencilerinin üniversite tercihlerinde dikkate aldıkları üniversite imajı çekicilerinin belirlenmesidir. Araştırmanın çalışma grubu Kocaeli ili İzmit ilçesinde öğrenim gören 450 lise son sınıf öğrencisinden oluşmaktadır. Betimsel tarama modelindeki araştırmanın verileri araştırmacılar tarafından geliştirilen yükseköğretim kurumlarının imaj çekicileri ölçeği ile toplanmıştır. Araştırma sonucunda lise öğrencilerin üniversite tercihlerinde en çok üniversitenin kalitesi imaj çekicisini dikkate aldıkları görülmüştür. Bu imaj çekicisini sırasıyla; üniversitenin sosyoekonomik olanakları, üniversitenin kültürel olanakları, üniversitenin bulunduğu şehrin olanakları, üniversitenin fiziksel olanakları, üniversitenin bulunduğu şehrin yaşanılan yere uzaklığı, üniversite ile ilgili anlatılar ve üniversitenin tanıtım etkinlikleri imaj çekicileri izlemektedir. The purpose of this study is to determine the importance level of image attractors in the process of University Selection for Senior High-School Students. The participants were composed of 450 senior high-school students. Research data in the model of descriptive survey was collected through image attractors’ instrument of higher education institutions developed by researchers. As a result of the research, it was observed that high school students mostly gave importance to the university quality image attractor in the process of university selection. This image attractor was followed by socio-economical opportunities of the university, cultural opportunities of the university, opportunities provided by the city where the university is situated, physical opportunities of the university, the distance between the residence city and the city where the university is situated, narratives about the university, and university promotion activities respectively. İmaj çekicisi, üniversite imajı, üniversite seçim süreci, üniversite tercihi, potansiyel üniversite öğrencileri. Image attractor; image of the university; process of university selection; university preference; prospective university student. Absher K., & Crawford, G. (1996). Marketing the community college starts with understanding students’ perspectives. Community College Review, 23(4), 59-68. Alves, H., & Raposo, M. (2010). The influence of university image on student behaviour, International Journal of Educational Management, 24(1), 73-85. Anılan, H., Çemrek, F., & Anagün, Ş. S. (2008). Ortaöğretim öğrencilerinin meslek seçimi ve üniversite tercihlerine ilişkin görüşleri (Eskişehir örneği), E-journal of World Sciences Academy, 3(2), 238-249. Arpan, L. M., Raney, A. A., & Zivnuska, S. (2003). A cognitive approach to understanding university image. Corporate Communications: An Internatonal Journal, 8(2), 97-113. Barich, H., & Kotler, P. (1991). A framework for marketing image management. Sloan Management Review, 32(2), 94-104. Beceren, E. (2010). Üniversite tercihlerinde ne kadar bilinçliler: Süleyman Demirel Üniversitesi öğrencilerine yönelik bir çalışma. Süleyman Demirel Üniversitesi Vizyoner Dergisi, 2(2), 101-110. Briggs, S. (2006). An exploratory study of the factors influencing undergraduate student choice: the case of higher education in Scotland, Studies in Higher Education, 31(6), 705-722. Briggs, S., & Wilson, A. (2007). Which university? A study of the influence of cost and information factors on Scottish undergraduate choice, Journal of Higher Education Policy and Management, 29(1), 57-72. Bringula, R., & Basa, R. (2011). Institutional image indicators of three universities: basis for attracting prospective entrants, Educational Research for Policy and Practice, 10, 53-72. Broekemier, G. M., & Seshadri, S. (2000). Differences in college choice criteria between deciding students and their parents, Journal of Marketing for Higher Education, 9(3), 1-13. Brown, T. A. (2006). Confirmatory factor analysis for applied research. NY: Guilford Publications, Inc.
Brown, R. M., & Mazzarol, T. W. (2009). The importance of institutional image to student satisfaction and loyalty within higher education, Higher Education, 58, 81-95. Coccari, R.L., & Javalgi, R.J. (1995). Analysis of students’ needs in selecting a college or university in a changing environment. Journal of Marketing for Higher Education, 6, 27–39. Cain, P. P. and McClintock, J. (1984) ‘The ABC of Choice’, Journal of College Admissions, Part 105, 15-21. Capraro, A. J., Patrick, M. L., & Wilson, M. (2004). Attracting college candidates: the impact of perceived social life, Journal of Marketing for Higher Education, 14(1), 93-106. Cerit, Y. (2006). Eğitim fakültesi öğrencilerinin üniversitenin örgütsel imaj düzeyine ilişkin algıları, Kuram ve Uygulamada Eğitim Yönetimi, 47, 343-365. Cubillo, J. M., Sanchez, J., & Cervino, J. (2006). International students' decision-making process, International Journal of Educational Management, 20(2), 101-115. Çokluk, Ö., Şekercioğlu, G., & Büyüköztürk, Ş. (2010). Sosyal bilimler için çok değişkenli istatistik. SPSS ve Lisrel uygulamala¬rı. Ankara: Pegem Akademi. Gavcar, E., Bulut, Z. A., & Karabulut, A. N. (2005). Öğrencilerin iktisadi ve idari bilimler fakültesini tercih nedenleri ve beklentileri (Muğla Üniversitesi Örneği), İstanbul Ticaret Üniversitesi Sosyal Bilimler Dergisi, 4(7), 21-39. Gotsi, M., & Wilson, A. (2001). Corporate reputation: seeking a definition. Corporate Communication : An International Journal, 6(1), 24-30. Helgesen, Ø., & Nesset, E. (2007). Images, satisfaction and antecedents: drivers of student loyalty? A case study of a Norwegian University College, Corporate Reputation Review, 10, 38-59. Ivy, J. (2001). Higher education institution image: A correspondence analysis approach. International Journal of Educational Management, 15(6), 276–282. Jöreskog, K. G., & Sörbom, D. (1993). LISREL 8: User’s reference guide. Chicago: Scientific Software. Karasar, N. (2008). Bilimsel araştırma yöntemi. Ankara: Nobel. Kazoleas, D., Kim, Y., & Moffit, M. A. (2001). Institutional image: A case study. Corporate Communications: An International Journal, 6(4), 205-216. Kern, C. W. K. (2000). College choice influences: urban high school students respond, Community College Journal of Research and Practice, 24(6), 487-494. Kline, R. B. (2005). Principles and practice of structural equati¬on modeling (2nd ed.). NY: Guilford Publications, Inc. Le Claire, K. A. (1988). Higher education choice in Australia: processes and impediments, Higher Education, 17, 333-349. Ming, J. S. K. (2010). Institutional factors influencing students’ college choice decision in Malaysia: a conceptual framework, International Journal of Business and Social Science, 1(3), 53-55. Moogan, Y. J., Baron, S., & Haris, K. (1999). Decision-making behaviour of potential higher education students. Higher Education Quarterly, 53(3), 211-228. Moogan, Y. J., & Baron, S. (2003). An analysis of student characteristics within the student decision making process, Journal of Further and Higher Education, 27(3), 271–287. Nguyen, N., & LeBlanc, G. (2001). Image and reputation of higher education institutions in students’ retention decisions. The International Journal of Education Management, 15(6), 303-311. ÖSYM, (2014). 2014 Öğrenci Seçme ve Yerleştirme Sistemi (ÖSYS) Kılavuzu. Özgüven, İ.E. (2011). Psikolojik Testler, Ankara: , PDREM Yayınları. Özyürek, R., & Atıcı, M. (2002). Üniversite öğrencilerinin meslek seçimi kararlarında kendilerine yardım eden kaynakların belirlenmesi. Türk Psikolojik Danışma ve Rehberlik Dergisi, 2(17), 33-42. Pampaloni, A. M. (2010). The influence of organizational image on college selection: what students seek in institutions of higher education, Journal of Marketing for Higher Education, 20(1), 19-48. Polat, S. (2011a). Üniversite öğrencilerine göre Kocaeli Üniversitesinin örgütsel imajı. Eğitim ve Bilim Dergisi, 36(160), 105-119. Polat, S. (2011b). Üniversite öğrencilerinin örgütsel imaj algısı ile akademik başarıları arasındaki ilişki. Kuram ve Uygulamada Eğitim Bilimleri Dergisi, 11(1), 249-262. Polat, S. (2012). 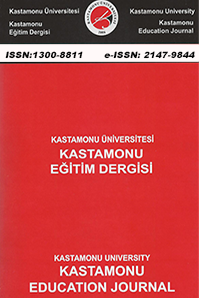 The factors that students consider in university and department selection: a qualitative and quantitative study of Kocaeli University, Faculty of Education students. Procedia Social and Behavioral Sciences, 47, 2140-2145. Ramasubramanian, S., Gyure, J. F., & Mursi, N. M. (2003). Impact of internet images: impression-formation effects of university web site images. Journal of Marketing for Higher Education, 12(2), 49-68. Sarıoğlu, S., Özkan, M. 2009. Meslek Yüksekokulu Öğrencilerinin Önlisans Program Tercih Sebepleri Cumhuriyet Üniversitesi Suşehri Timur Karabal Meslek Yüksekokulunda Bir Uygulama. 1. Uluslararası 5. Ulusal Meslek Yüksekokulları Sempozyumu, Selçuk Üniversitesi Kadınhanı Faik İçil Meslek Yüksekokulu, Konya. Simões, C., & Soares, A. M. (2010). Applying to higher education: information sources and choice factors, Studies in Higher Education, 35(4), 371-389. Šontaitė-Petkevičienė, M. (2013). The view of students towards corporate reputation of Lithuanian Universities. Management of Organizations: Systematic Research, 66, 115-127. Sümer, N. (2000). Yapısal eşitlik modelleri. Türk Psikoloji Ya¬zıları, 3(6), 49-74. Tatar, E., & Oktay, M. (2006). Search, choice and persistence for higher education: a case study in Turkey. Eurasia Journal of Mathematics, Science and Technology Education, 2(2), 115-129. Tavşancıl, E. (2005). Tutumların ölçülmesi ve SPSS ile veri ana¬lizi (2nd ed.). Ankara: Nobel Yayınları. Turban, D. B., & Dougherty, T. W. (1992). Influences of campus recruiting on applicant attraction to firms. Academy of Management Journal, 35(4), 739–765. Veloutsou, C., Lewis, J. W., & Paton, R. A. (2004). University selection: information requirements and importance, The International Journal of Educational Management, 18(3), 160–171. Wilkins, S., & Huisman, J. (2013). Student evaluation of university image attractiveness and its impact on student attachment to international branch campuses, Journal of Studies in International Education, 17(5), 607–623. Yurchisin, J., & Park, J. (2010). Effects of retail store image attractiveness and self-evaluated job performance on employee retention, Journal of Business and Psychology, 25(3), 441-450. ISNAD POLAT, Soner , ARSLAN, Yaser , YAVAŞ, Elif . "Üniversite Seçim Sürecinde Üniversite İmaj Çekicilerinin Önem Düzeyi: Potansiyel Üniversite Öğrencileri Üzerinde Bir Uygulama". Kastamonu Eğitim Dergisi 24 / 4 (September 2016): 1919-1934.